Family Circle's Regina Ragone loves Epicuren's Cinnamon Vanilla Brown Sugar Scrub for how it smells and how well it works. She also mentions Epicuren's Apricot Cream Cleanser and Pumpkin Apple Spice Peel. 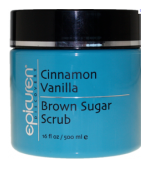 Click here for more information on Epicuren's Cinnamon Vanilla Brown Sugar Scrub.